One Denver apartment building, located at 330 Acoma Street in the Baker neighborhood was featured in a CBS News report on September 25, 2014 because of recent issues with asbestos in the building. This dangerous toxin has a history in older buildings with serious repercussions if not handled properly, and it seems that a construction company doing work on the building in the Baker neighborhood released these lethal materials. Many of the residents at this Denver location are outraged and worry that they have potentially been placed in harm’s way, and it’s still unclear who might be at fault. Asbestos fibers, which are microscopic, have properties that made them extremely popular – especially in construction materials such as roofing shingles, floor tiles, and ceiling materials, to name a few – in the late 1970’s. Two primary reasons that they were readily used were their resistance to fire and most chemical reactions as well as being extremely durable. Unfortunately, the factors that made them such amazing assets when used in construction projects also made them hazardous to the health of those exposed. Asbestos is classified as a human carcinogen – in layman’s terms, poison. The microscopic particles that make it durable and fire resistant, when inhaled, also allow the fibers to cling to various parts of the respiratory system. They embed themselves in the soft tissues and the body is unable to expel or break down these toxins. Anyone that has inhaled asbestos could be at risk and their respiratory health potentially compromised. The most common health conditions associated with asbestos are lung cancer, mesothelioma, and asbestosis – all very serious ailments. Is Any Amount of Asbestos All Right? Because asbestos is extremely hazardous when inhaled as loose fibers in the air, most stable materials or ones that are in-tact or undisturbed but contain asbestos are not an immediate risk. In some cases, the amount of actual asbestos in a building material can vary from 1-100%, meaning some products have only trace amounts of asbestos in them. Buildings constructed prior to 1981 are required to post a warning regarding asbestos in the building. An outside laboratory can test and then provide the owners with a list of building components that contain asbestos and others that are asbestos-free. If you are purchasing a home, the current owners should disclose if any asbestos is present in the home, in what materials, and the location. Because asbestos is still out there, construction companies and companies that specialize in asbestos abatement are required to follow environmental guidelines to protect themselves and the public. For instance, if workers are asked to work in an area that has materials that contain asbestos, even if those materials aren’t to be altered, they should wear respirators and have Environmental Health & Safety (EHS) test to ensure the area is safe. One should never knowingly drill, hammer, cut, saw, break, damage, move or disturb materials that contain asbestos unless they are properly trained. Even deep cleaning materials with asbestos in them have precautionary measures to follow. If removal or disturbance of asbestos materials is taking place, it should only be performed by contractors that are certified in asbestos abatement. These specialists should be skilled and understand the proper procedures when handling this toxic material. And, the area should be tested before anyone is allowed to inhabit the space after any abatement work has taken place to ensure it is safe. How Do I Know if I’m Safe? One of the best rules of thumb to keep in mind is that asbestos becomes hazardous when it is disturbed and becomes airborne. It is a toxin when inhaled. Most buildings and even homes that were built prior to 1981 that have asbestos have been tested and appropriate action taken to prevent future harm, but knowledge is power. If materials containing asbestos were used in the construction of any building, these should be disclosed to the property manager and/or owner. This is helpful for future construction projects or if any unforeseen damage occurs. If you just aren’t sure about asbestos and would like to know the history of your living or work space, you can use the Denver Department of Health locally or the US Environmental Protection Agency on a national level as your resources. 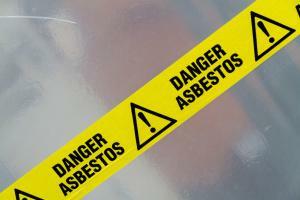 If you or anyone you know has been exposed to asbestos, contact a doctor immediately. If you feel you might have a case against the person or company responsible for exposing you or a loved one to asbestos, request a FREE case evaluation from McDivitt, or call us today to find out more about your rights.